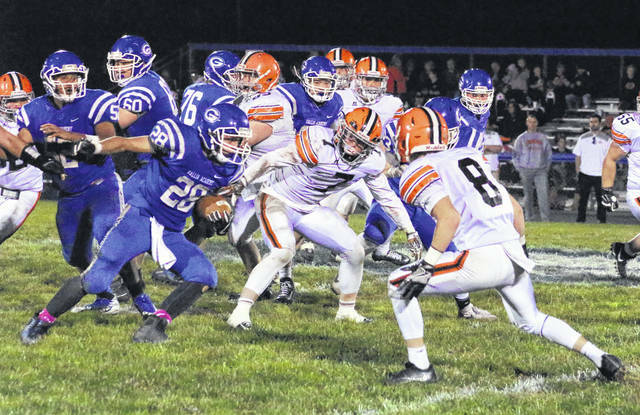 Gallia Academy junior Boo Pullins (28) picks up yardage during a second half run in a Week 9 OVC football contest against Ironton at Memorial Field in Gallipolis, Ohio. A total of a six Blue Devils were chosen to the 2017 All-Ohio Valley Conference football team, as voted on by the coaches within the eight-team league. Gallia Academy — which finished tied for third, matching Portsmouth with a 4-3 league record — landed four first team selections to go with a pair of honorable mentions. For the second straight season, GAHS quarterback Justin McClelland — a junior who also plays in the defensive backfield — was named to the All-OVC first team. Joining their signal caller on the first team for the Blue Devils, are first-time all-league performers Garrett Burns, Nathan Mitchell and Boo Pullins. Burns and Mitchell are both seniors at GAHS, with Burns lining up at wide receiver and defensive back and Mitchell representing the offensive and defensive lines. Pullins, a junior, was a running back and a line backer on the gridiron. Gallia Academy’s honorable mention spots went to junior Caleb Henry and senior Matt Moreaux. Henry was a wide receiver and a defensive back, while Moreaux — who was a first team selection in 2016 — played running back and line backer for the Blue and White. The conference Coach of the Year award went to Coal Grove’s Evan Ferguson, who led the Hornets to a perfect 7-0 campaign in the league. COAL GROVE (7-0): Sam Angelo, Kimo Baldwin, Darin Bloomfield, Nate Harmon, Jeb Jones, Josh Waulk. FAIRLAND (6-1): Keedrick Cunningham, Chase Fisher, Joel Lambiotte, Ty Wilcoxon, Kobe Newman. GALLIA ACADEMY (4-3): Garrett Burns, Justin McClelland, Nathan Mitchell, Boo Pullins. PORTSMOUTH (4-3): Isaac Kelly, Talyn Parker, Colin Boehm, Anthony Ferrara. IRONTON (3-4): Gage Salyers, Trent Klaiber, Garrett Carrico. ROCK HILL (3-4): Zak Adkins, T.J. McGinnis, Cameron Barnette. CHESAPEAKE (1-6): Austin Browning, Zach Wright. SOUTH POINT (0-7): Caleb Eplion, Seth Nicely. COAL GROVE: Kyle Sites, Joey Workman. FAIRLAND: Greg Keeney, Mason Cox. GALLIA ACADEMY: Caleb Henry, Matt Moreaux. PORTSMOUTH: D.J. Pearsall, Jaden Josey. IRONTON: Ethan Duncan, Seth Fosson. ROCK HILL: Jaret Bacorn, Eli Matney. CHESAPEAKE: Brevin Webb, Dalton Nida. SOUTH POINT: Walker Clay, Kyle Smith. Coach of the Year: Evan Ferguson, Coal Grove.